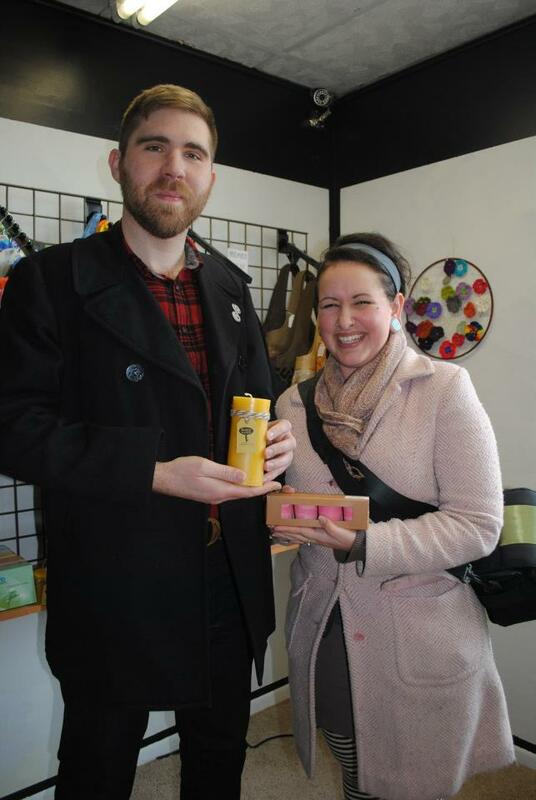 We went to the opening of Dear Jupiter in Cambridge, Minnesota this weekend and had a great time! We wanted to share a couple photos from the event. The store had a variety of crafts and supplies available. We are happy to be broadening our sales area in Minnesota and getting more exposure outside of the Twin Cities. We saw our friend from Volomortuus selling her handmade yarn there as well. Her stuff is great. 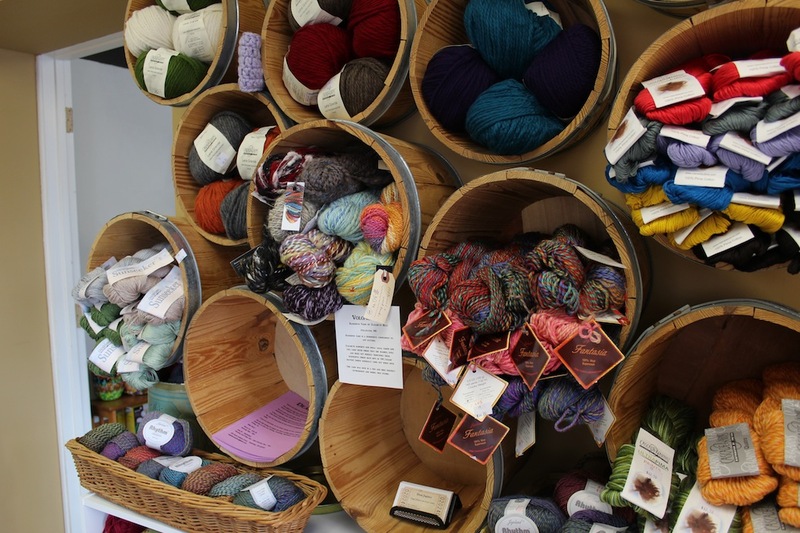 Also, what a cute display for yarn! Going to the opening of a store really makes me itch for our own place. We worked in a candle store together for years and it really was the best job I’ve ever had. When I was younger I would have never expected to be an entrepreneur but now that I’ve explored different careers I can see how fantastic it is! I know it can be hard some days too. It has been great getting to know small business owners and hear their mistakes and successes. We look forward to sharing more with you as we find it out ourselves! Today we are traveling up to Cambridge Minnesota for the opening of Dear Jupiter Gifts and Crafts store. Dear Jupiter will be carrying our votives, tealights and pillar candles. Cambridge is a pretty small town and we’re happy to hear there is a store like this moving in! 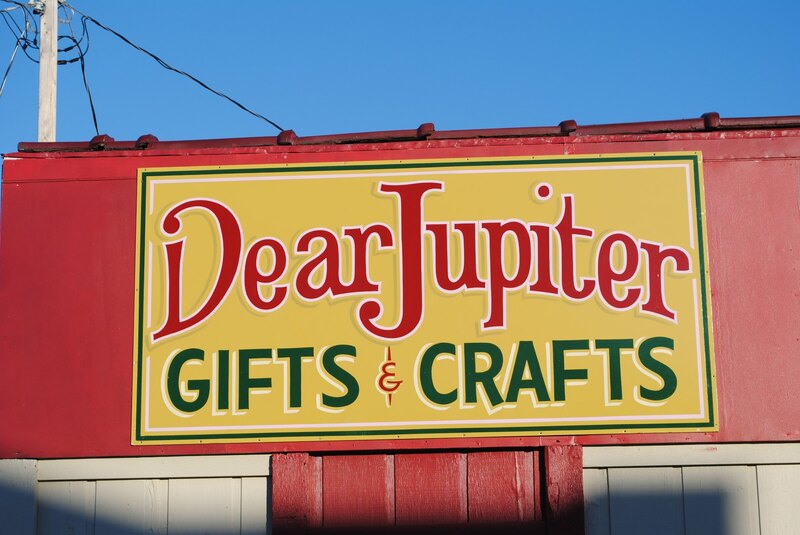 The town recently lost its only craft supply store so Dear Jupiter will not only be carrying gifts but also craft supplies. For the opening there will be snacks and goodie bags while supplies last starting at 5 PM. If you’re in the Cambridge area, stop by tonight and check it out! When we started making birthday candles last year I never would have thought brown would become our most popular color! I didn’t think brown was an appetizing color to put on top of food, but with neutral colors being so popular right now the brown has shot up to the top of our best sellers list. Again, I thought that our grey candles wouldn’t do so well but they are probably the second most popular since they’ve come out. 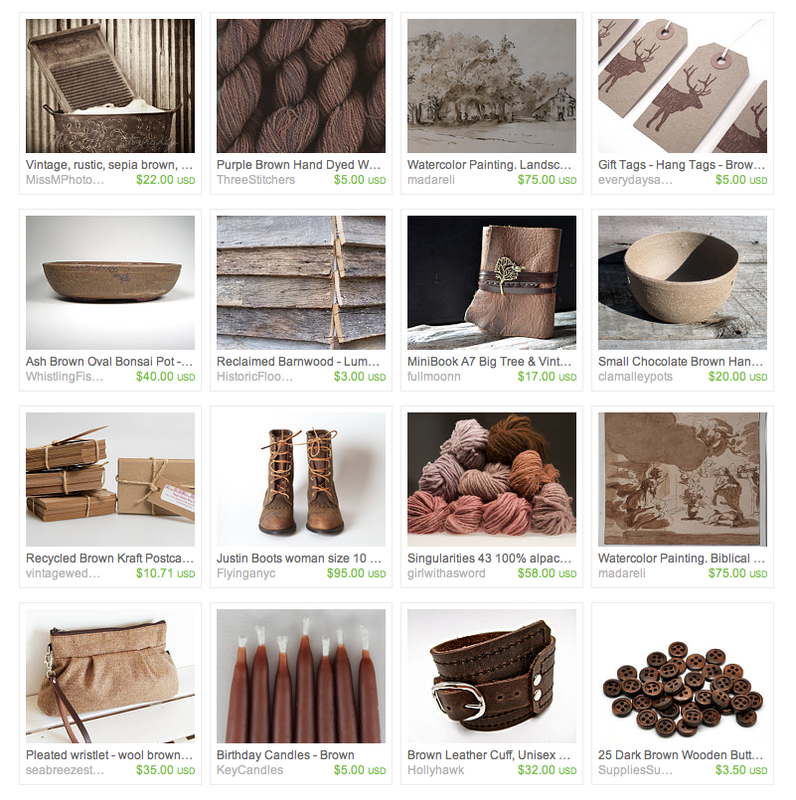 We were just featured in a great treasury focusing on brown colors made by Etsy user Madareli. Check it out! This week we’re featuring these aluminum taper holders made by an American design group named Assembly. 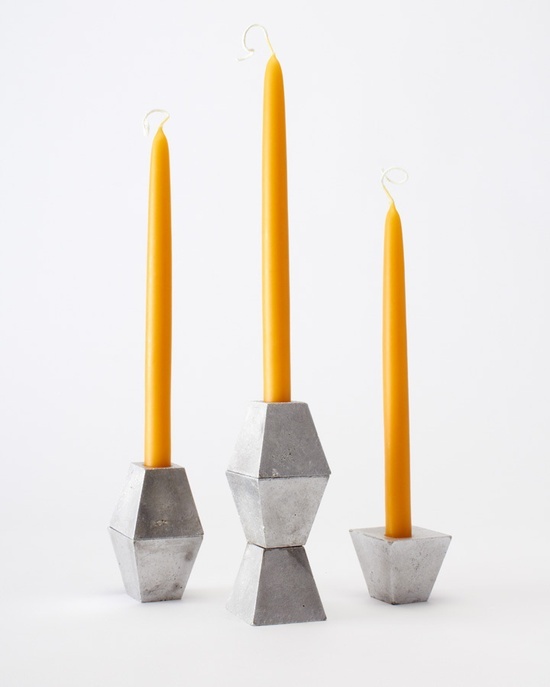 The Hide Candlesticks can be taken apart and reassembled into different forms. I’m not usually interested in this modern style, but I think these are pretty awesome. I’m surprised they went with beeswax for their photo, but I think it works! We’re currently working on some taper candles and playing around with different colors. Keep an eye out for ’em on our etsy page! Hey friends! I’m super zonked and going to bed but I thought I’d share something quickly about Etsy selling. I found a website called Craft Count ( www.craftcount.com ) that rates etsy sales. You can search by category to see who has the most sales in that area. I was pretty surprised at some of the top sellers in the Candle department! You can also see who has made the most sales each day. Today it was someone who sells buttons! If you’re an etsy seller you should check it out and let us know what you find! Doing taxes for our small business has been the most daunting task of this adventure so far. I will admit that I can barely type my simple personal taxes into turbo tax let alone figure out how the heck we deal with all of these receipts and what not. When we worked at our old candle shop we kept all of our costs in a handwritten ledger and our receipts in a pile for an accountant to deal with! Oh how I feel for her now… Anyhow, after many hours of adding (many completed by Jonny as I am number-phobic) we went to H&R block and had them help us figure out what to do with it. After everything we evened out. Well, thats a couple hundred dollars of advice. Bummer. I’m forgetting about Candleholder Thursday today and going for a Throw Back Thursday. 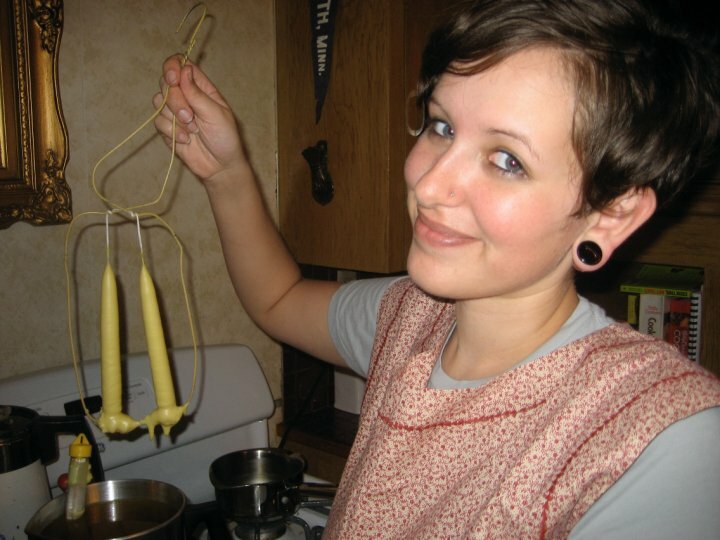 I found this picture of me making candles in the kitchen of my first Minneapolis apartment. The first sets of Key Candles!